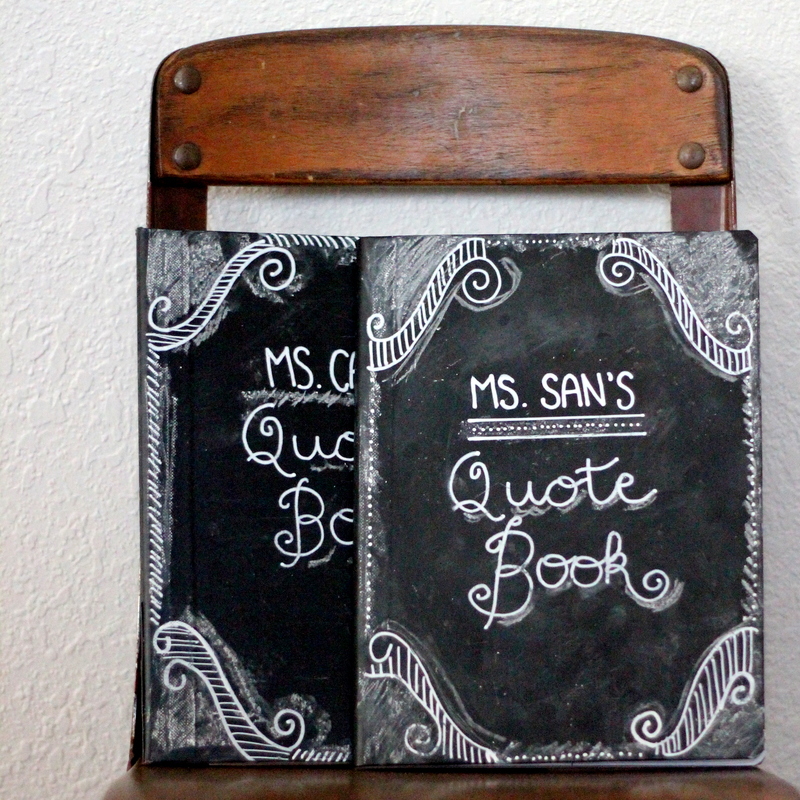 As the end of the school year approaches (here in Denver, at least), I thought I’d share the chalkboard covered journals that Burke and I made as a gift for his teachers. They are easy to put together, inexpensive to make (I think I spent $2 on each one) and such a hit! I blame my days as a classroom teacher for this-I have tons of opinions about the best ways to show teachers how much you appreciate them. I tend towards practical gifts (think Starbucks gift cards) and also love any chance to express heartfelt, personal thanks. I especially love pairing the two of those. These journals (we made them into Quote Books so that Burke’s preschool teachers have a spot to record the hilariousness that they hear every day) plus a Starbucks gift card fit right into that sentimental-plus-practical category. 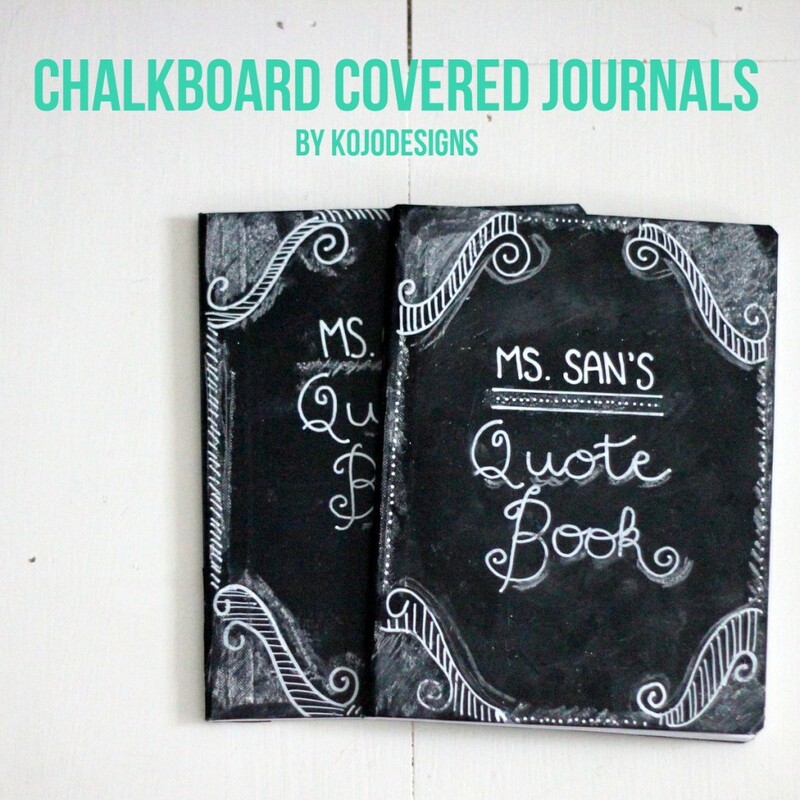 Would you like to make a chalkboard notebook for a teacher in your life? 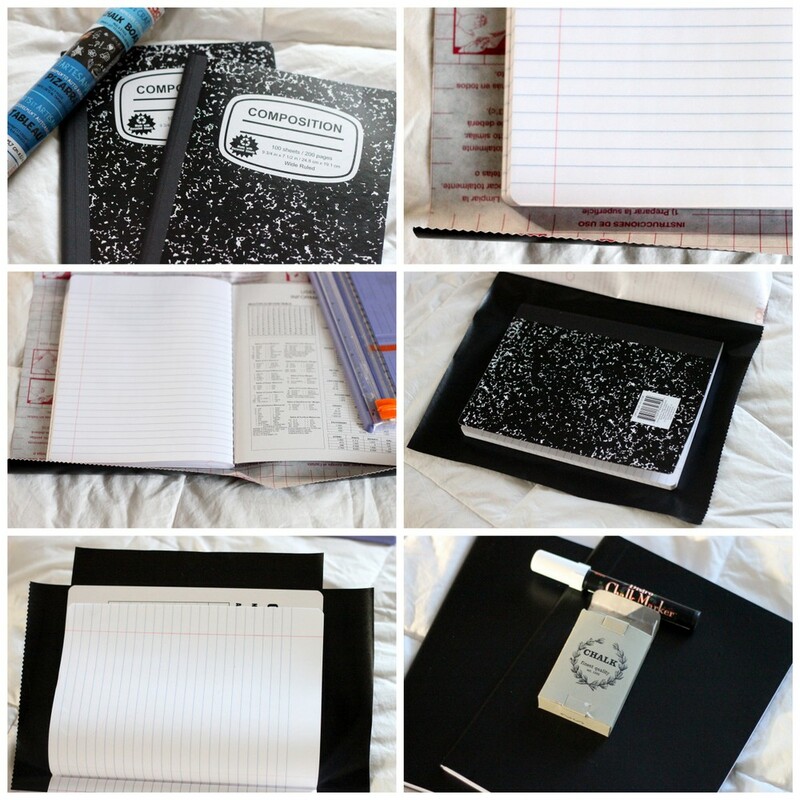 First gather your supplies- a plain composition notebook, chalkboard contact paper (I got mine on Amazon), and scissors. Lay your opened notebook on top of the contact paper to measure how much you’ll need. Give yourself a border of at least an inch all the way around the edge. Also, close the notebook while holding the contact paper in place to measure how much you’ll need for the spine. Once measured, cut the contact paper. Notch the corners so you won’t have excess contact paper overlapping at the corners. To adhere, peel up one edge of the contact paper backing and place the back cover of the composition book in the center (again, leaving the perimeter you cut all the way around your cover). Carefully roll the spine of the comp book onto the contact paper, covering. Unpeel the rest of the contact paper and smooth onto the front cover of the comp book. Now, fold the excess around the edges of the book, trimming the excess on the spine and on the corners (if they’re rounded). 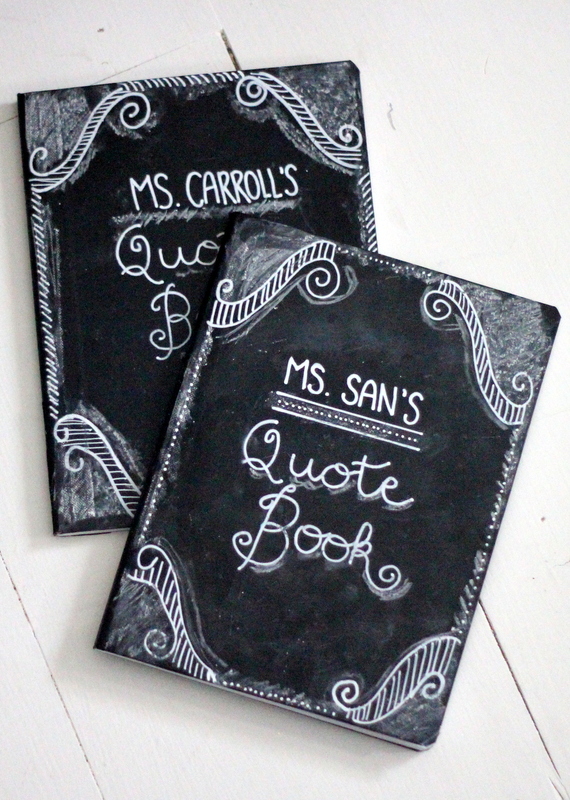 Now the fun part- grab a chalk pen and some chalk and decorate the notebook (I did the front- Burke did the back), wrap up with a bow (and a gift card) and deliver to the teacher you appreciate! ADORABLE!! Jonah’s last of school is tomorrow, so I don’t have time to pull this one off. But I’m definitely tucking this idea away for next year! 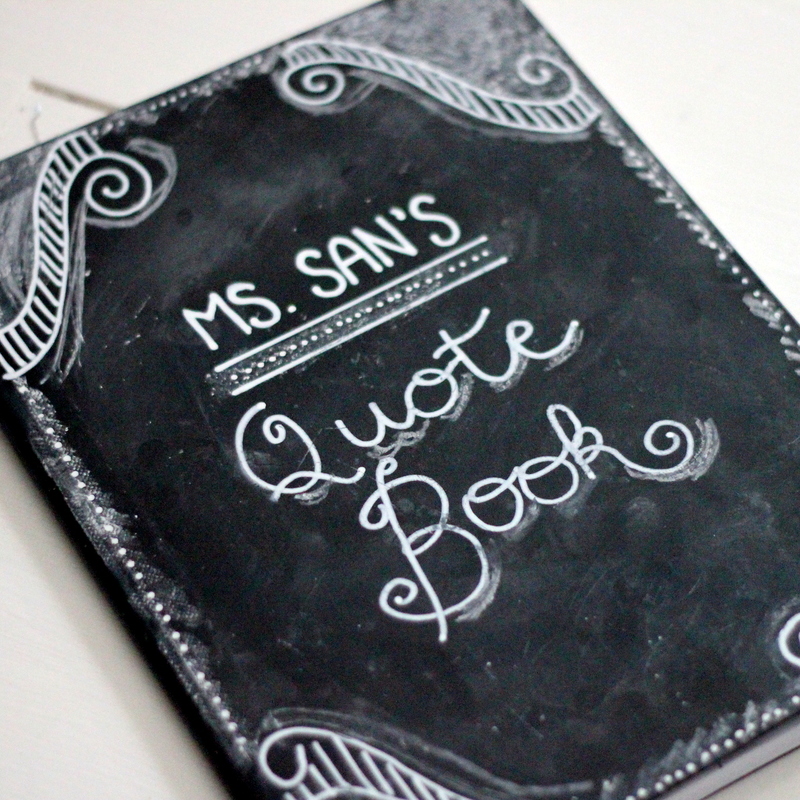 These are wonderful – and I don’t imagine there’s a teacher out there who hasn’t heard her pupils say something hilarious now and then, so what a great idea to give her a dedicated journal to record it! I think you make a great point too about practical gifts. 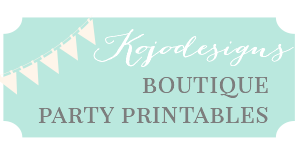 Gift-giving etiquette varies slightly between our two countries, but I think your point applies to both; something like a gift card is always great for someone whose personal tastes and/or hobbies you may not know. You know, Melissa, cone to think of it I do sometimes write down funny conversations I’ve had with my nephews, kids have such a different perspective on life, they’re great! I love this… I would love to have a record of the funny things my kids/cousins/etc. say. Cute cute cute!!! Love this!